1) Available in single and double head model..
2) The tube filling, sealing and coding machine is sturdy compact in design and simple in operation. It consists of an aluminium-rotating disc with interchangeable tube holding sockets for different tube sizes. 5) 1 HP motor, 440 V., 1440 rpm. 3 phase AC motor, Gearbox of 30:1 ratio. Electrical panel box with circuit breakers. No tube no fill process switch. 2) Automatic tube filling, sealing and coding machine for Lami/plastic tubes. 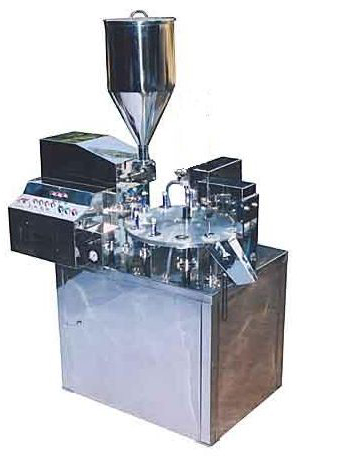 3) Automatic tube filling, sealing and coding machine for Aluminium tubes. 4) All in one (for plastic, lami & Al.) Automatic tube filling, sealing and coding machine.